At every ugly turn that your Life takes, just remember this: you really don’t know what’s round the bend, so don’t despair, don’t conclude that Life is unfair, don’t give up. Just flow with Life. Often times in Life, events unfold with seeming cold-bloodedness, that leave you socked. But Life operates on a plane of inner evolution more than what is evident. Every external event is designed to help you dive deeper to discover yourself, summon your endless inner potential and for you to awaken to the right way of thinking, living, working and winning. What we call ‘fate’ or ‘chance’ is actually a mysterious turn that always delivers a fruitful outcome in the end. A friend recently suggested, in a lighter vein perhaps, that motivational speaking (with an obvious reference to my ability to inspire audiences) is easy. I thought about it. To churn out nuggets of wisdom perhaps is indeed easy. As easy as it is for Messi to score a goal or Tendulkar to have hit any of his 100 international centuries! 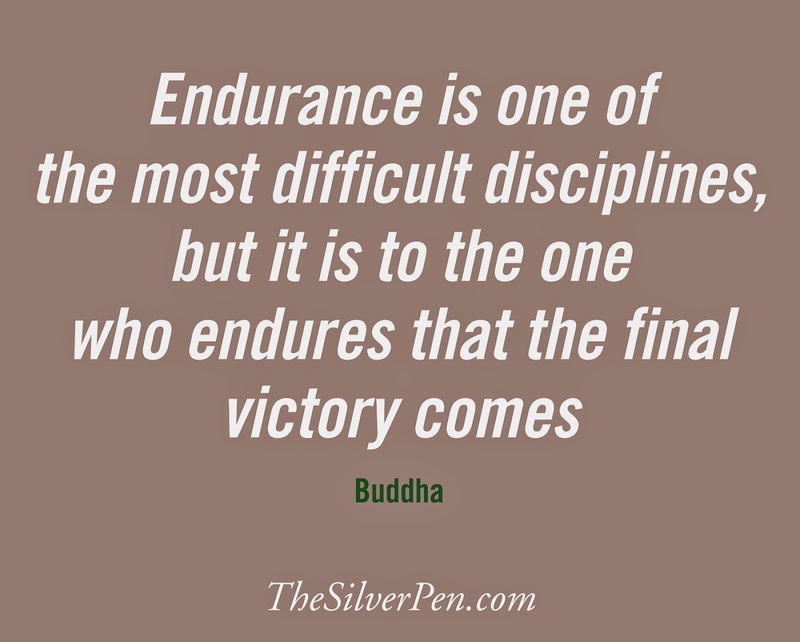 But all ‘easiness’ comes only from endurance. I always like to clarify that I am more an inspired, motivated speaker than just a motivational or inspirational speaker. I am inspired from the way Life has dealt with me and motivated by the way it continues to challenge me. What the world sees as a post every morning, that invokes soul, provokes thought and hopefully inspires action, comes from the ability to live in each moment, fully, drink in the bliss it contains, and learn from the experience. All this, despitethe external circumstances. To be sure, I wasn’t this way at all. Just over 15 years ago, I was a man in a hurry: angry, foul-mouthed, chewing tobacco and drinking daily. Perhaps, arrogant and jealous too. Yet I led our consulting Firm well and profitably. We had six offices, 40 people, and 38 highly satisfied clients across the world. Then, something happened. From an evolutionary perspective, perhaps, hubris__that ugly English word!__set in. From a business point of view, a couple of strategic mistakes happened that led to our Firm going bankrupt and we, as a family, becoming insolvent. (More on this story and what the experience taught me is contained in my Book, “Fall Like A Rose Petal – A father’s lessons on how to be happy and content while living without money”; Westland, August 2014) It was traumatic. But when I look back, without that ugly turn, I wouldn’t have been able to understand the value of this gift called Life. I wouldn’t have been inspired to unravel the meaning behind the two words: “Intelligent Living.” I wouldn’t have been motivated to plough on. I wouldn’t have understood what loving and relating, as taught by Osho, the Master, really meant. I wouldn’t have understood the value of relationships nor the impermanence of money and Life! I wouldn’t have experienced the kindness and compassion that is so intrinsic to the human race. I wouldn’t have learnt my Life’s most important lesson: always “serve”before you say you “deserve”! So, that’s a short autobiography to let you know that Life’s design is indeed as inscrutable for me as it is for you! Life deals with all of us__similarly. The events in our lives may still be different, but Life is always leading us to the same destination. Which is Self-Realization. And however difficult the road may just be, remember this too: Life’s Master Plan has no flaws. You will arrive and awaken, just as all of humanity, including me, has. It is in the Unknown that you will find the true treasures of Life. We have been sadly conditioned to expect rewards and recognition for every effort we make. These expectations bring agony. The pursuit of any goal by itself does not cause suffering. It is in not seeing outcomes that we desired that we feel defeated and begin to suffer. When what we seek is not what we get, we give up and choose to stay with the predictable. By itself, it is not a bad choice. The problem arises when we start lamenting about Life, whining and feeling depressed or let down. Understand that Life has a mind of its own. Its benevolence and creativity is shrouded in its eccentricity. (Aren’t all creative folks a wee bit eccentric?) It is unpredictable and moves is bizarre ways. That’s why all of the world’s wealth is with a chosen few. And a large mass of people__like you and me__are hardworking, ethical climbers with no idea of where the top of this ladder we are on will lead us. A larger mass of people, the strugglers, have no desires than just getting past basic stuff (that which we climbers take for granted) like two meals a day, a home, something to cover themselves with and, possibly a steady source of income or education. There are no answers to why a Sachin Tendulkar should be ordained with boundless abundance and glory while Vinod Kambli should have not got there__though both came from similar backgrounds, trained with the same coach and were equally talented. 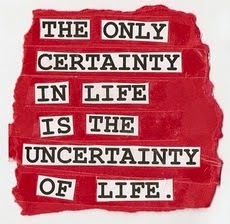 The point is that Life’s unpredictable. Period. And the way to deal with its eccentricity__often seen as its unfairness__is to simply Let Go and be prepared for the Unknown. Do your bit, joyfully, ethically, sincerely, and Let Go. Every other aspect of Nature’s creation thrives in Let Go mode. The birds, the trees, the insects, the reptiles, the animals, they have all Let Go. We humans are afraid to Let Go because we have a fear of the Unknown. So we suffer. But clinging on and expecting desirable outcomes is a foolish choice. So, in every sense, our suffering is self-inflicted. When we Let Go and face the Unknown, remember, we will never be let down. There will be no more suffering. The true treasures of Life, which were always there, will now be visible to us: we will feel the air in our lungs, see the beauty of creation all around us, find ourselves drenched in grace and feel happiness in our every pore. Life’s pretty amazing! It may not always give you what you want, but none of what you need is ever denied! This is true for each one of us. Irrespective of who we are and what we are going through. A lot has been talked, in the past week, about Prithvi Shaw, the 15-year-old batting prodigy from Mumbai. There have been comparisons to Sachin Tendulkar’s brilliance and origins as Shaw amassed a mind-boggling 546 runs off 330 balls in the Harris Shield tournament. The media has gone ga-ga over this boy wonder. But one story in The New Indian Express yesterday, by sports writer Sandip G, caught my attention. It talked about Shaw’s background. Shaw’s story reinforces a truism about Life. Not knowing what to do in Life, as Pankaj Shaw has confessed, is a great state to be in! That let-go is what Life requires from you in order for it to give you what you need. I have found this particularly true in my Life. Whenever I have reached a state of being clueless, and helpless, I have always found people walking into my Life, on their own at most times, and offering to support me and my family. One moment I would see no way ahead in a Life-and-death situation. My Life would be surrounded by total darkness. And in the next moment, I have found myself soaked in abundance and the milk of human kindness. This has happened again and again and again. 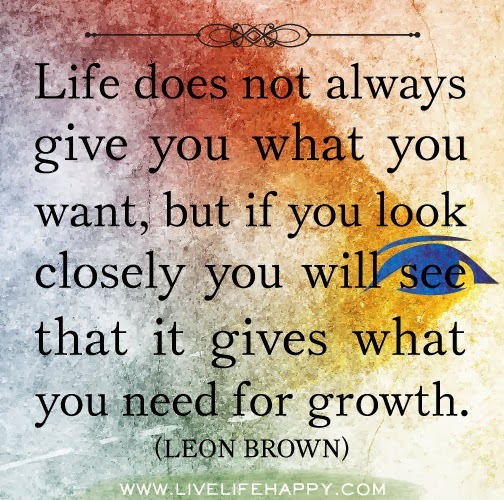 When I connect the dots backward, as Steve Jobs famously said, I have found that Life gives you all that you need, when you let go! I have realized that miracles happen to you not because you pray hard or your faith is stronger but they happen because at one level you are a miracle yourself and, at another level, you need a miracle to move forward in Life! It’s a beautiful Life really. You and I make it miserable by wanting it to be different from what it is. Drop all your wanting. It’s perfectly alright to not know what to do with your Life or in it! Let go! 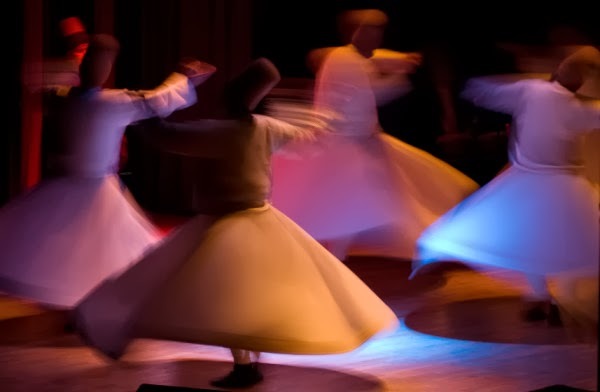 And, magically, you will find that Life manifests the right people, the right connections, the right situations, which will take you onward, giving you all that you need! You cannot live your entire lifetime in one nanosecond or moment. Life’s moves from moment to moment. Living Life, one moment at a time, savoring what you have, without question, without resistance, will always lead you to whatever you need. A loving, understanding and compassionate family is the greatest wealth anyone can have. 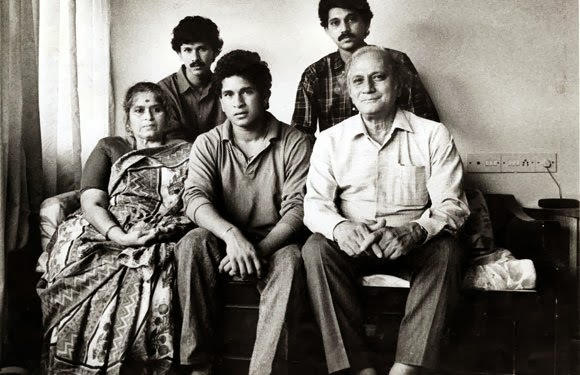 As Sachin Tendulkar bid an emotional adieu to his cricketing career yesterday, what struck me most was how his family had backed him all these past 29 (including his pre-international playing days) years. Sachin graciously acknowledged their role too in his farewell speech. Sachin’s father Ramesh Tendulkar married twice. From his first wife, Ramesh had three children – Nitin, Savita and Ajit. Sachin was born to Rajni, Ramesh’s second wife, and he is the couple’s only child. While Ramesh’s role in raising and inspiring Sachin, to be the champion that he eventually turned out to be, is well-known, I really admire how well his two half-brothers and his half-sister have nurtured him. 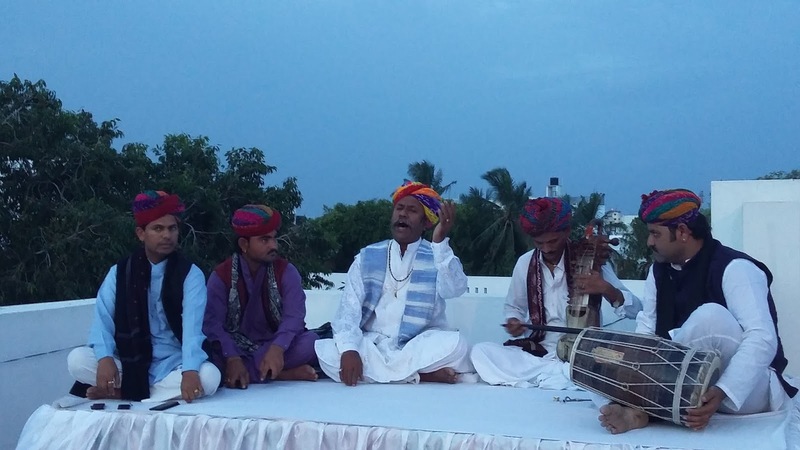 Often in India, members of families where one parent has remarried, end up growing distant, if not always estranged. But Ramesh managed to keep the flock together. And his first three children have set a glorious example in the manner in which they helped their step-mother Rajni raise their precocious and precious half-brother. Sachin did talk eloquently yesterday about how Nitin has quietly contributed to his career and how Savita gifted him his first cricket bat. He also spoke about how Ajit, all through Sachin’s cricketing career, has stood by him – right from taking his prodigal brother to coach Ramakant Achrekar for the first time in 1984 to discussing Sachin’s dismissal at 74, in-depth, in his final, 200th, Test at the Wankhede. Yet whether it was his half-siblings, or his wife Anjali or his late father or his mother Rajni, the Tendulkar family has stayed out of the limelight – preferring to do only what came to them naturally and what they were best at: which is, to totally back Sachin! That attitude is inspiring and speaks volumes about the family’s value systems – humility, mutual respect and togetherness. I come from a fractured family that continues to confound me. My siblings and I live in the same city but fail to even speak with each other. We have always found, over the years, reasons and issues to remain divided and distant. With the passage of time, I realize, we don’t even perhaps relate to each other. Surely, I too have contributed to this situation in the past and have since apologized to my family for my actions. But mistrust and the urge to interpret__than understand__each other are so rampant amongst us that any effort we have made in the past to come together has always failed. To compound matters, when my wife, children and I encountered a Life-changing, near-death crisis, a bankruptcy, some years ago, my family felt we were “faking” the crisis. They had helped us financially and when we could not repay the money we owed them, we were not trusted for our word. The crisis did not hit me as hard as my family not trusting me did. But for my wife, who supported me, helping me anchor emotionally and brave that painful phase of my Life, I would have crumbled. From my experience, I have discovered that love, understanding and compassion are the bonding glue in any family. These traits blossom and thrive only when the family thinks as one unit – like a cohesive, understanding team – and not as diverse individuals who are merely connected with each other by blood and birth (which is what defines a family!). Merely being related to each other does not a family make. Respect for each other’s opinions, actions and decisions, trust and companionship are critical for making a family come alive and stay together. Families cannot be built by possessing or controlling each other. They evolve only when space and time are given to its members – to experience Life in their own ways, to go out into the world, to try, to make mistakes, to fail and to still feel “welcome” at home. Members in a family cannot be separate from each other and expect the relationships in the family to grow stronger. It is simply not possible for separateness and bonding to co-exist! A family will stand up for its name only when each of its members stands up for each other. When people stop saying “I told you so” and instead say, irrespective of what has happened, “How can we make things better”. Sachin is blessed to have been born into a family where they value and respect each other. The Family Tendulkar is surely an inspiration for all of us. We may not quite be able to raise another Sachin in our families without some cosmic benevolence perhaps, but we sure can create an environment in our families, on our own, where we trust, cherish and celebrate each other! What can you be best at in the world? – What’s your innate talent? What are you deeply passionate about? – What keeps you excited about living? What drives your economic engine? – What earns you money? To reach your own state of perpetual joy, you need to only shift your attention from your economic engine circle to the other two circles – concerning your talent and passion – in your Life. Then you too will be soaked in bliss and will be able to uncork the magic within you! Here’s then, cheers, to the MAESTRO called YOU!